PROPHACY AWARDED WITH 2015 "BEST ORIGINAL ALBUM OF THE YEAR"! An Epic Gothic Opus of Sound and Fury! "T.A.G.L.A.Y." is an elite level Hip-Hop / Horrorcore track about being outcasted and abused by society, till the point of forcing ones psyche into thoughts of vengeful redemption. A massive 25+ tracks went into the instrumental production alone (Skady & Prophacy), which helps create a deep ethereal yet highly energetic sound. 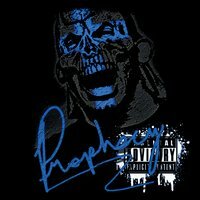 Prophacy himself also brings his best vocal game to the overall instrumental track providing over 20 unique background vocal tracks, essentially turning one man into a dark choir of hymns and vocal sound samples. As if Prophacy's unique multi-genre / multi-layered rapid flow style wasn't already deadly enough on top of such a powerful beat, Prophacy adds even more artillery to "T.A.G.L.A.Y." by bringing in his equally deadly emcee brethren. Hip-Hop legend and lyrical icon Chino XL himself comes out of his recent slumber to lyrically slay and lay to rest any and all naysayers, while the United Kingdom's swift tongued Reckless shows that even on an international level... T.A.G.L.A.Y. **"PROPHACY" album available through all digital music retailers.